It is essential to understand the essence of organ donation. It involves donation or harvesting of transplantable organs from living or dead or brain-dead person, known as the donor, to the one who needs those vital organs for survival, known as the recipient. Organ donation is the donation of organs of the human body or biological tissue from a living or dead person to a living recipient in need of a transplantation. Transplantable organs and tissues are removed in a surgical procedure following a determination based on the donor’s medical and social history to know which organs are suitable for transplantation. This type of transplant occurs when a living person wishes to donate organs to someone in need. Living donors are usually family members or blood relatives. All living donors must meet basic medical criteria and undergo a very thorough medical evaluation before being accepted as a suitable donor. This kind of transplant involves taking organs from a person who has just died. The person’s family must first give consent if organs are to be used for transplantation. This type of transplant requires waiting on a list until a suitable organ is available. All of us can be organ donors, irrespective of age, caste, religion, community, current or past medical condition. Children can also be organ donors after taking consent for organ donation from their parents. However, active cancer, active HIV, active infection (for example, sepsis) or Intravenous (IV) drug use are some of the contra-indications. Patients who have Hepatitis C may still donate organs to a patient who also has Hepatitis C. The same is true for Hepatitis B — but this happens in very rare cases. Most cancer patients may donate corneas. Vital Organs like heart, intestines, lungs and pancreas can be donated only in case of ‘brain death’. However other tissues like corneas, heart valves, skin, bones etc. can be donated only in case of natural death. In case of liver transplant, a part of the liver can be donated by the living patient. For kidney transplant, if both the kidneys of the donor are healthy then one of the healthy kidney can be donated. Do donor’s blood and tissue type have to match the recipient’s? It’s easier to transplant an organ if the donor and recipient are a good match. The transplant team will put the donor through a series of tests to determine whether the blood and tissue types are compatible with the recipient’s. What else should I know about organ donation? 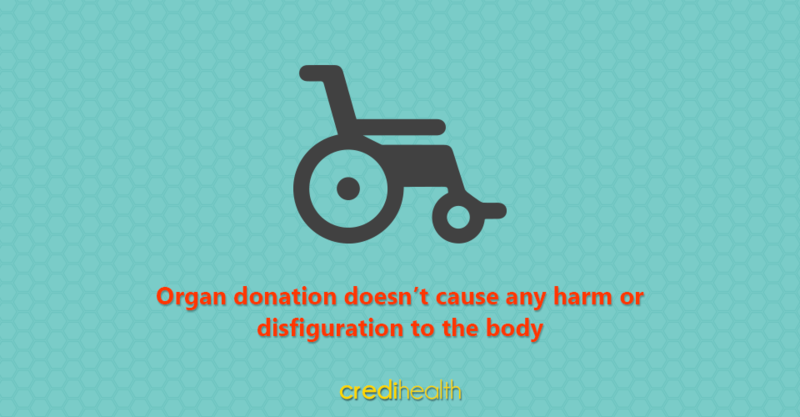 Organ donation doesn’t cause any harm or disfiguration to the body: Transplantable organs and tissues are removed surgically without causing any noticeable disfiguration. 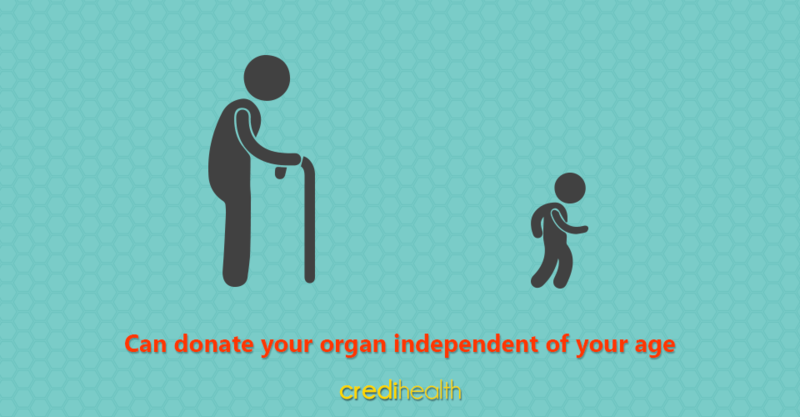 You can donate your organ independent of your age: Your age doesn’t bind you from donating organs; if the doctor confirms that your medical condition at the time of donation is apt, your biological age doesn’t matter. You don’t pay to donate organs: The surgical procedure and all the expenses pertaining to organ donation are borne by the donor network or institution facilitating organ donation. 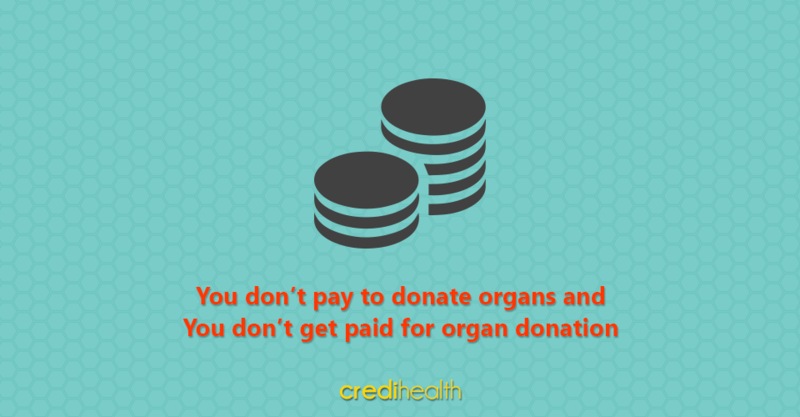 You don’t get paid for organ donation: as is evident, donation is a charitable act and doesn’t ensure any financial gains or money return. You shouldn’t fall trap to touts who lure you for donating your organs, in lieu of petty money. 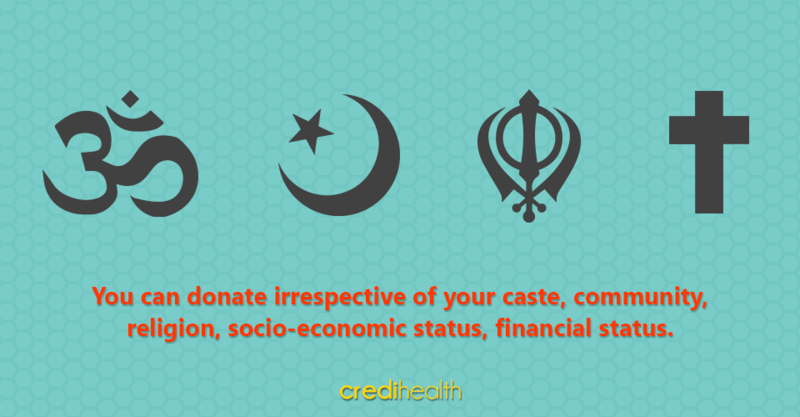 You can donate irrespective of your caste, community, religion, socio-economic status, financial status. The only consideration would be to match the recipient tissue before initiating the transplant procedure. 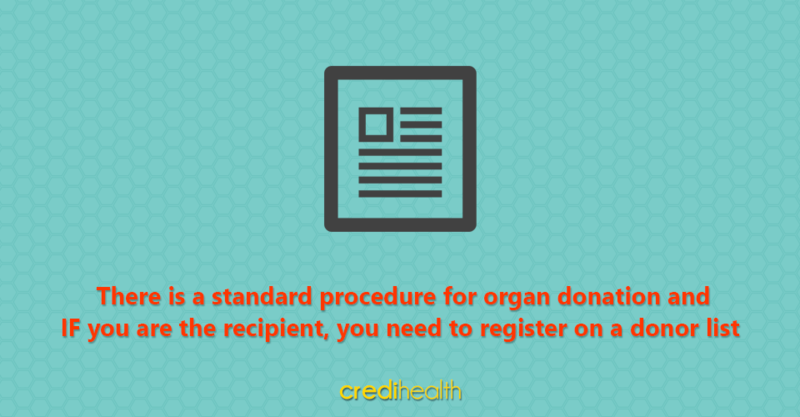 There is a standard procedure for organ donation: Once you decide to donate, you need to register with an organ transplant registry to make the decision public. They would be providing you with an organ donor card, which you should always carry in your wallet. You also need to share your intent to donate, with your family, who can contact these registries, in event of any mishap. If you are the recipient, you need to register on a donor list and based on your number on that list, you would be informed of your status. 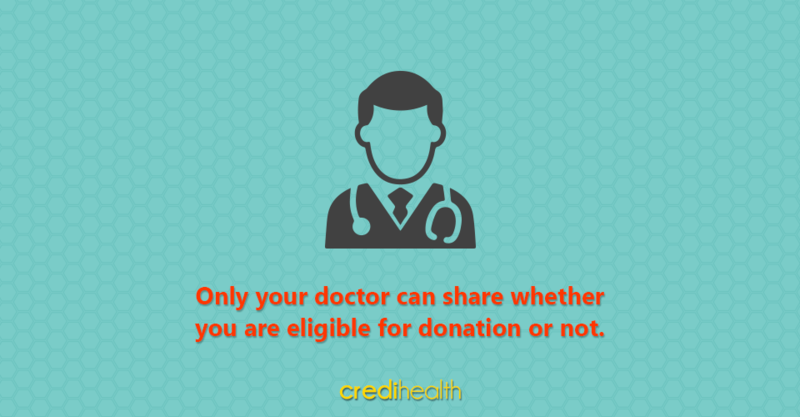 Only your doctor, after detailed medical examination, can share whether you are eligible for donation or not; Only few critical conditions like HIV and cancer, can prevent you from considering donation, rest need to be confirmed. You would be treated with the same dignity and respect extended the same medical support, for routine and critical condition, irrespective of whether you are a donor or not. What is the importance of a donor registry? A registry is an essential part of understanding who and where potential donors are. A registry gives a planner enough information to devise strategies to get more public cooperation and commitment towards organ donation. Having a registry in place allows doctors and transplant coordinators to check if a brain dead person wished to donate and then approaching the family for consent becomes easier. It helps in saving crucial time in the process of organ donation. At present, we do not have a central registry in India. Through this initiative we intend to make the government of India create one. How does organ donation help families of deceased donors to cope with their loss? The act of organ donation has the ability to comfort grieving families. It is always difficult to lose a loved one. Many grieving families of organ donors draw comfort from the fact that their loss may help to save or improve the lives of others. Studies carried out to understand how a family’s wounds heal have shown that the support from family members helps a person to overcome grief. The support of friends and religious and cultural beliefs also help donor families. Most of the donor families agreed to donate organs because they felt that it was the only positive outcome from their loss. Why should I believe in organ donation? Each year, thousands of people die while waiting for a transplant, because no suitable donor can be found for them. The need for organ donors has never been greater. Nationally, with a population of 1.2 billion people, the statistic stands at 0.08 persons as organ donors per million population (PMP). This is an incredibly small and insignificant number compared to the statistics around the world. Countries like the USA, UK, Germany, Netherlands have a ‘family consent’ system for donations where people sign up as donors, and their family’s consent is required. (These countries have seen the donations double Per Million Population averaging between 10-30 PMP). Other countries like Singapore, Belgium, Spain have a more aggressive approach of ‘presumed consent’, which permits organ donation by default unless the donor has explicitly opposed it during his lifetime. These countries have seen the rate of donations double, averaging between 20-40 PMP. We understand it is difficult to think about organ donation when you have just lost a loved one; however organ donation is a generous and worthwhile decision that can save many lives. By donating, each person can save the lives of upto 7 individuals by way of organ donation and enhance the lives of over 50 people by way of tissue donation. Get Liver Transplant Cost in India from trusted NABH & JCI accredited hospitals – FREE.